London Zoo is the oldest scientific zoo in the world, and it’s one that I never got round to visiting, until now. On the day that I went it was cold but bright, meaning that I would get some good photos and that it wouldn’t be too busy; I think I was right on both counts. On arriving I first headed towards the small mammals area. They looked curious and peeped out from their hiding places to see who had come to visit. After a quick look I headed towards the lions that are newly housed there and were one of the reasons that I wanted to visit. As they were one of the main attractions the area was decorated and staged as if it could be an authentic Indian village, with colourful paintings and props. The lions themselves were huge and very impressive and with only a pane of glass between them and us, I was able to have a look up close and see the might of such creatures. Next I went on to see the petting animals where they had some tiny, super cute kids that you could feed and play with and that the young children seemed to enjoy. The llamas and camels were nearby too that I could see. A short distance away, the tigers were housed. The adult tiger was very active and difficult to photograph but my patience paid off when I managed to get a clear photo. I was also rewarded with seeing the beautiful baby cubs, playing and running around. As it was coming up to Christmas there were reindeer out on walks with zookeepers, meaning that I was able to get close. Onwards I went to see one of my favourite animals, the giraffes, making me happy upon reaching their enclosure. I always find giraffes surreal looking with their long necks and gangly legs. I loved that they were so close it seemed that if they really stretched, they could easily lick my camera. The path then led me onto the Reptile house which had some quite scary looking but beautiful reptiles from around the world. There were some magnificent birds at the zoo too, some that could fly and some that couldn’t, each with their own colourful and unique features. Some were in cages but the larger ones were left in an open space, making me wonder why they hadn’t flown away. I had a quick walk around the Bug house but as I’m not a fan I didn’t hang around too long. What I did find surprising was that there were live ants on display that didn’t have any glass around them. They were Leaf-cutter ants and looking carefully closer I could see each of the ants marching back and forth across a rope carrying tiny pieces of a leaf to take back to its home. I didn’t take too many photos of this area as bugs aren’t too appealing to me but it was amazing to see some of the numbers enclosed such as the hundreds of locusts and various stick insects. I sharply made a turn into the aquarium next, to warm up and see the pretty fish. Amongst all the diverse fish in tanks I was pleased to come across some miniature blue starfish too. Lastly I came across the Butterfly house, where I was debating whether to go in or not, seeing as I don’t particularly like flying things (apart from birds). I did decide to enter thinking I could make a sharp exit if it wasn’t for me, and I was really glad I did. Once my camera stopped fogging up in the warmer temperature of the area, I could see some beautiful, exotic butterflies flitting around, including the Glasswing Butterfly which I’ve already posted about. There was an array of brightly coloured butterflies, most of which were too fast to capture, but after ducking and flinching about a hundred times I think I managed to get some nice photos. There were also moths in the house but they were largely inactive being night time creatures. The Atlas moths were amazing, I wasn’t sure they were real at first due to their stillness and size; each wing being the size of my hand, but as always, nature astounds. There were so many other animals around too, such as the gorillas and monkeys, penguins, Komodo Dragons and tortoises, to mention a few. Some weren’t easy to photograph or even see but the vast variety of the animals in London Zoo is amazing. I know zoos can be seen as bad places that imprison animals; I did feel particularly sad for the big cats and caged birds, but as the world we live in is increasingly destroying habitats, I feel a place like London Zoo can help preserve and protect some endangered animals. I spent most of the day looking around and there was still areas I missed as the place is huge. I really enjoyed seeing all the different animals and their colourful and varying feathers, scales, fur and skin, and I feel like I learnt lots too. My recent trip to the farm was fun and interesting and once my family and I had seen all the animals we headed over to my sister’s house to get some rest and some delicious food. Once we were all fed and relaxed it was time to cut the birthday cake my sister had made for her daughter. Weeks of preparation had gone into making the cake and the end result was brilliant. It was colourful, fun and neatly fitted into the theme of the day; animals. 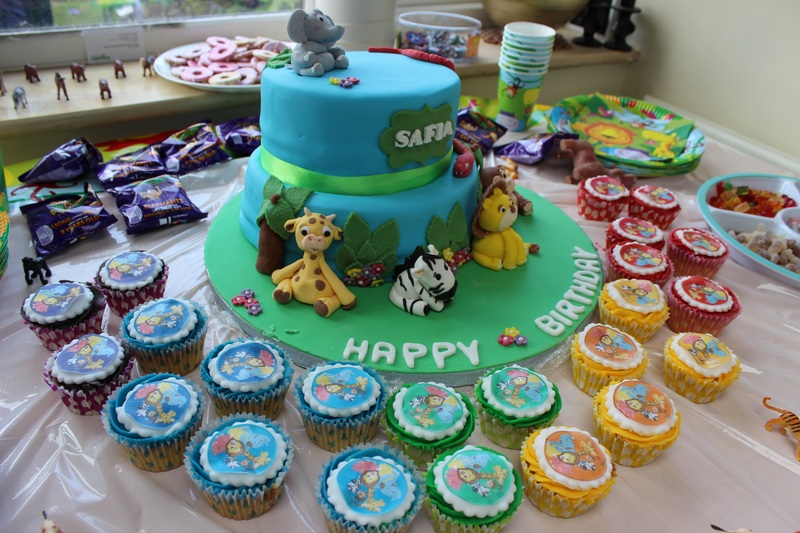 My sister made all the animal cake figures from scratch as well as the cake and the matching cupcakes. I love all the details of the animals and how the rest of the table was tied in with animal toys scattered around the table and animal characters on the cups, plates and napkins. Once the candle was lit and blown out by the birthday girl we all tucked in, and enjoyed a cake that tasted as good as it looked. I wish the birthday girl good health, happiness and love for all the years ahead of her.